Up and down this street as far as the eye can see are crumbling and burned-out buildings. This used to be a thriving business district. It’s where Vlasic Pickle, White Owl Cigar, and Lay’s Potato Chips grew into national brands. Today, the most evident sign of commerce is the prostitutes walking the street. Smack in the middle of this is Peacemaker’s International. It’s a storefront church where Ralph King is a member. 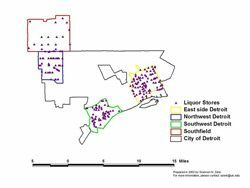 There are about seven liquor stores for every grocery store here on the east side of Detroit. Some people can drive to the well-stocked supermarkets in the suburbs, but many families don’t have cars, and King says the city busses are spotty. That means processed, high-starch, high-fat diets that lead to illnesses like heart disease, diabetes, and high blood pressure. Those are all problems that disproportionately hit African Americans, and public health researchers say those higher rates of illnesses are linked to the food availability problems in poor black communities. Amy Schulz is with the University of Michigan, and she’s studied the lack of grocery stores in high-poverty neighborhoods. In other words, if you’re poor and white, you have a better chance of living near a grocery store than if you’re poor and black. Ralph King and the folks in this neighborhood want to get around that problem. So about three years ago, they decided to try and reopen a nearby farmer’s market. They turned to Michigan State University Extension for help. Mike Score is an extension agent. The farmer’s market was a flop. Score says produce vendors set up in the neighborhood, but the fruits and vegetables sat all day, unsold. He says the problem was they were using the wrong currency. Most people in this neighborhood have very little cash on hand, and they need to use their food stamp cards to shop for groceries. So, Score helped develop a plan for a neighborhood buyers’ club that can negotiate low prices by ordering in bulk. 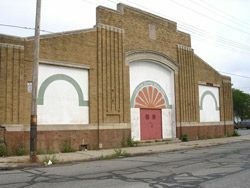 His business plan also calls for job training for people in the neighborhood. It’s been a struggle to get the program off the ground. It took a long time to get approval from the U.S. Department of Agriculture for a machine to read peoples’ food stamp cards. People have stolen some of the project’s meager resources, but Mike Score and Ralph King say they’ll stick with it until families in this neighborhood can put decent food on their tables. And they say they hope it can be a model that other low-income communities around the country can use.